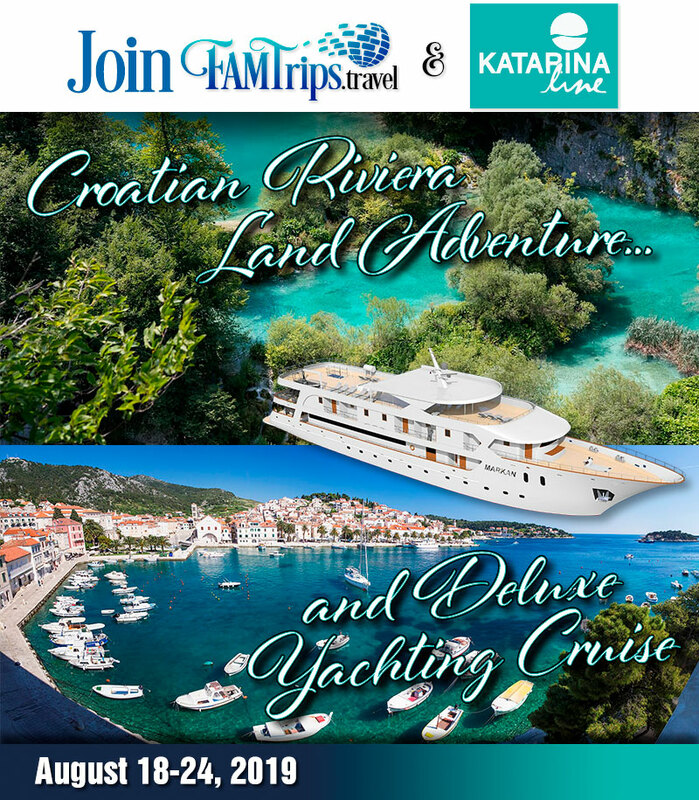 Join FAMTrips.travel and Katrina Line for our summertime on the Croatian Riviera for our first Deluxe Yachting Cruise and combined Land Fam! This educational program which is co-hosted with Katarina Line offers you the opportunity to tour the most sought after sites in Croatia, followed by a wonderful three night voyage on their luxurious 38-passenger Superior Deluxe MV Markan on the Adriatic Sea to three amazing islands. To begin the land based portion of this amazing itinerary, you begin in Venice, Italy! Yes, you may want to come in a few days early to experience the magic of Venice, too! You may elect to fly into either airport in Venice, either Marco Polo or Treviso, and later on August 18, we will be transferred to the beautiful city of Opatija, Croatia on the Croatian Riviera. Here we will begin a three day land-based program including the magical history-fill city of Opatija, the unforgettable and exquisite Plitvice Lakes Region and ending in Split, Croatia, including tours in all three regions along the way to meet Katarina Line’s MV Markan in Split Harbor. Here we will be welcomed aboard our superior deluxe rated ship and set sail on the Adriatic Sea to being our yachting adventure to three of Croatia’s most romantic islandsand their sun-soaked port cities waiting for your arrival. 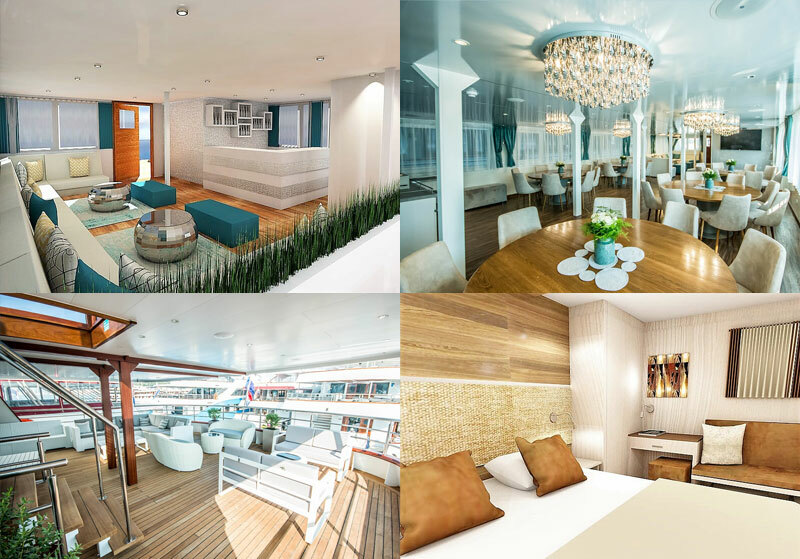 This deluxe Katarina Line vessel has only 19 staterooms, so do not delay in booking your Croatian Riviera and Adriatic Cruise Adventure FAM. Upon your arrival on your own international flights, you will be greeted at the Venice airports of either Marco Polo or Treviso. We will transfer to Opatija on the Croatian Riviera. Located in the bay of Kvarner and having the longest tradition of more than 170 years in Croatia tourism, the town is often called the Pearl of the Adriatic. Although its maritime and agricultural roots go back centuries further, Opatija developed intensively under the rule of the Austro-Hungarian Empire. In fact, the town was proclaimed a climatic health resort and for centuries has been a popular destination for many royals, and famous personalities throughout Europe and the world. The first thing you will be interested to explore is the famous 12 km long Opatija promenade which was built in 1911. Walking along the promenade you get to see the luxurious villas – examples of the Secession architecture as well as the symbol of Opatija, the Maiden with Seagull. Dinner is included and we overnight in our four star hotel in Opatija. 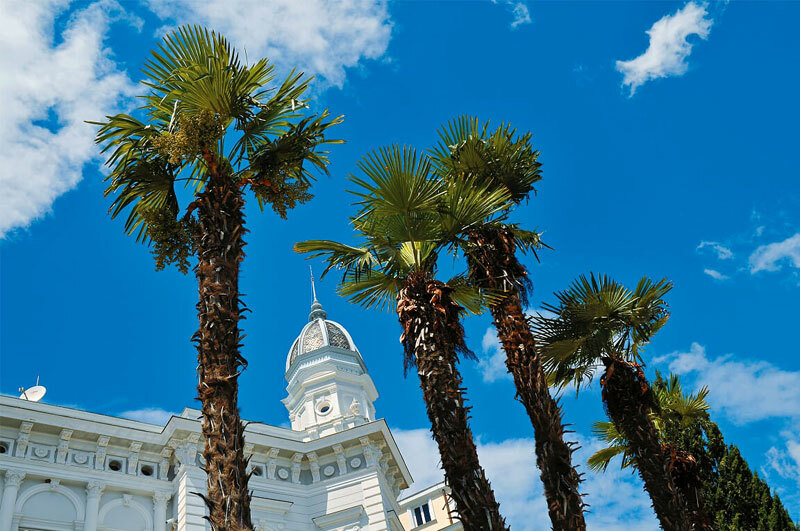 After a leisurely breakfast, we will enjoy a morning guided tour of Opatija, once the summer and winter resort of 19th Century elite Wilhelm II, Franz Josef, Gustav Mahler, and Isadora Duncan. Overnight in Opatija. In fact, for centuries the town was proclaimed a climatic health resort and has been a popular destination for many royals, and famous personalities throughout Europe and the world. During your free afternoon, you may want to check out Opatija’s shopping center called Operetta which is probably one of the most beautiful shopping centers in Croatia. You might choose to visit the Villa Angiolina where you will find the Croatian Museum of Tourism now. The most significant churches, also worthy of your visits in Opatija are the church of St. James built in the 15th century, the church of Our Lady of the Annunciation and the Evangelical church. This evening you are free to enjoy one of so many wonderful restaurants in this lovely city, and our hosts will certainly give us their best recommendations. Today we depart after breakfast to visit and tour the spectacular Plitvice National Park, consisting of 16 lakes, connected with a series of waterfalls. The Plitvice Lakes National Park is the oldest and largest national park in the Republic of Croatia, famous for its numerous turquoise-colored lakes separated by tufa, or travertine, barriers. Plitvice Lakes in Croatia is one of the world’s great natural wonders, a lush and pristine valley with not only 16 dazzling terraced lakes, but is also sparkling with more than 90 waterfalls and several kilometers of boardwalk. Often described as the most beautiful national park in Europe, Plitvice regularly makes lists of undiscovered gems or hidden secrets of Europe. You will be amazed as we take a leisurely walk in this wonderful environment. We will also enjoy a boat ride on the emerald green Kozjak Lake and return back to the entrance of the park. Later we depart for Split, Croatia for our overnight stay in our 4-star hotel. Morning guided tour of Split and its famous Diocletian palace. This morning after breakfast, we will enjoy a guided tour of the city. With the rugged Dalmatian mountains as a backdrop and the azure Adriatic Sea lapping its shores, Split is emerging as one of the must-see cities of Europe. 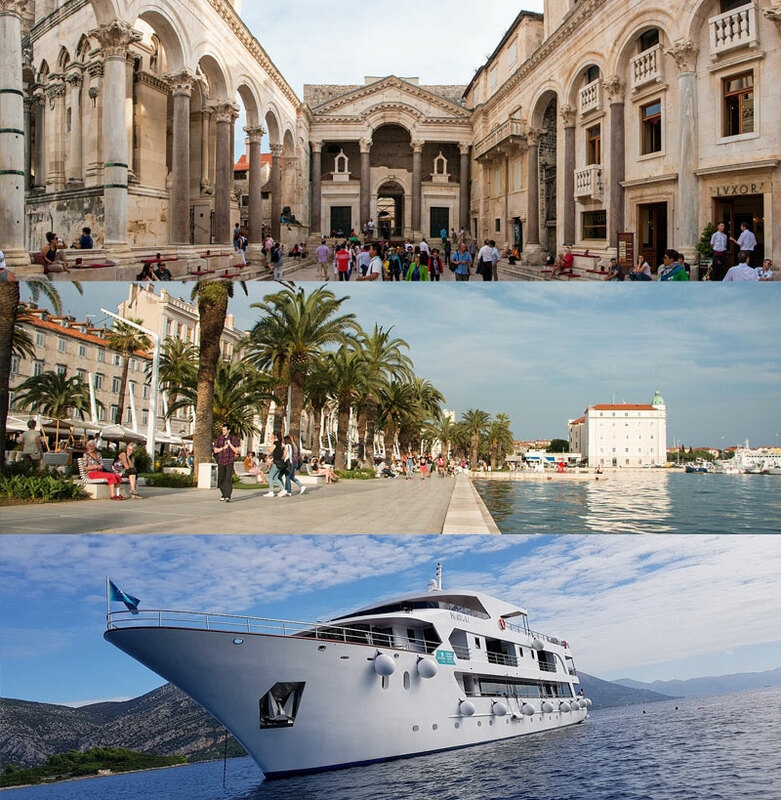 A mix of modern life and ancient history, Split is a historic town under UNESCO protection on the World Heritage list. One will find an abundance of Roman architecture and of special interest is the magnificent Diocletian Palace, erected by the Roman emperor in the 4th century. Once home to thousands, its sprawling remains include more than 200 buildings. Within the Palace’s white stone walls and under its courtyards are a cathedral and numerous shops, bars, cafes, hotels and houses. After the tour of Split, we will continue to the Split harbor to board our Deluxe Superior Category vessel, Katarina Line MV Markan. We board our ship in Split, enjoy a welcome drink and a lovely three course lunch as we depart to the island of Hvar. Hvar is the longest Island in the Adriatic and one of the sunniest; known for lavish lavender fields and breathtaking beauty. One can find many historical landmarks in Hvar- the Renaissance cathedral with its original tower, and the oldest community theatre in Europe which was founded in 1612. You may choose to hike up to the town fort overlooking the beautiful harbor to get some lovely scenic views of your ship and the Pakleni islands. This evening we are treated to a lovely dinner in a local restaurant so that we may experience the true feel of the island! In the evening Hvar offers an abundance of entertainment with many restaurants, bars and cafes open long into the night. Overnight onboard MV Markan in Hvar. In the morning, we will sail away from this beautifully scenic town of Hvar and continue our cruise towards the Island of Korcula, best known as the birthplace of Marco Polo. Aboard our MV Markan this morning we will enjoy a presentation by our Katarina Line representative who is sailing with us to highlight the amazing opportunities to build land and yachting groups for Croatia and beyond with Katarina Line! We stop for lunch in one of the secluded bays en route. Early afternoon arrival in Korcula will be followed by a guided walking tour of this enchanting town with fortified walls. On the island, you can find more legends, tales and monuments than anywhere else while you wander along the herringbone patterned streets. Overnight in Korcula with a wonderful 3-course dinner included onboard the ship. Of course, Korcula has an abundant choice of restaurants where you can continue your gourmet experience if you prefer to stay in town to dine. Or if you wander back in to town after dinner, there are many bars and clubs for those looking for evening entertainment. This morning after our breakfast onboard the ship, your hosts from FAMTrips.travel and Katarina Line will enjoy some free time with you to discuss any future opportunities that you might be excited to organize for future profits! Katarina Line is excited for you to bring your best ideas so that they help you make your clients’ dream vacations a reality! Our final stop will be the Island of Bra? and picturesque town of Bol. We will have a fun swim stop in front of the famous Golden Horn Beach. Also known as Zlatni Rat, this beach is often selected as one of the 10 best beaches in Europe. After our three course lunch served onboard, you may elect to walk along the promenade and enjoy the lovely atmosphere of the village of Bol, a typical fishermen’s town turned into a popular tourist destination. In the early evening, we will enjoy a special wine tasting in the facilities of the oldest Dalmatia wine cooperative (dating back to 1903) followed by the Captain’s dinner and live music onboard our lovely MV Marken as we enjoy our final night as the guests of Katarina Lind on the MV Markan. Early in the AM we sail back to Split for our disembarkation. Based upon your individual plans, FAMTrips.travel and Katarina line will assist you in lining up your individual or group transfers once we have collected all departure air schedules and other travel schedules. Group or individual transfer prices will be quoted once we know how we can match up travelers going to specific points of departure. Optional individual or group transfers can be arranged, based upon group’s departure plans. ** For a limited number of agents who prefer to fly into Zagreb, Croatia on day one of the land portion of this trip, Katarina Lines can accommodate you with your first two nights in Zagreb before you are transferred to meet the rest of the group at the Plitvice National Park. You will not get to visit Opatija if you fly into Zagreb instead of Venice. From there you may continue with the final two days of the land stay with the group in Split before boarding the ship with the group. FAMTrips suggests that doing the full program from Venice ( as outlined above) and transferring to beautiful Opatija from the beginning of the trip is the preferred program.